Impax Media ‘s Lesley Conway. Launched in July, Impax is a digital out-of-home company that operates a product called the “digital media gate” – a checkout lane gate featuring a 32-inch, 1080p digital screen. 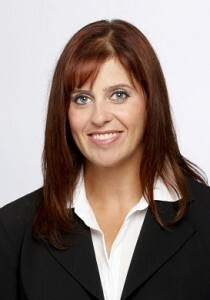 Prior to her role with Bell, Conway was executive vice-president of sales for Astral Out-of-home, which was acquired by Bell in 2013. She also served as EVP for Astral Radio Plus from 2008 to 2011, and was VP general manager of CHUM Radio sales prior to its purchase by Astral. Impax’s digital media gates double as a security system and an advertising delivery tool. The monitors sit above the checkout lane, displaying 15-second ads alongside content from Canadian Press in a three-minute loop. When lowered, the monitors – which are made of shatterproof glass – block access to closed checkout lanes. Montreal-based mechanical engineer Stephen Kucer, who is now listed as an advisor with Impax, developed the units to combat theft – which accounts for as much as one third of shrinkage in the grocery industry – while Impax president Shmuel Gniwisch married them with technology that determines when people see the screen as well as their gender and approximate age. This technology addresses what Conway said had traditionally been a problem for the out-of-home advertising industry – assessing who is seeing ads. While the Impact units don’t identify or store images of people who notice the screens, they are able to determine age and gender. According to a study conducted for Impax by Ispos, 75% of shoppers said watching content on the screens made their time in line (an average of three minutes) feel shorter, while 83% said the gates were entertaining and pleasant to watch and 76% recall seeing at least two screens during a single store visit. The Impax product is currently installed in select Metro stores and the independent Pasquier Grocery in Quebec, as well as two Vince’s Market locations in Ontario. Participating stores have an average of eight gates installed, said Conway. Impax installs the gate units at no cost to the retailer, and shares proceeds from ad sales (Conway did not provide the revenue split). The company expected to have a presence in 43 Canadian stores by the end of the year with the goal of becoming a national media player. Calgary Co-Op stores have already signed on with the product, and the company is in discussions with Vancouver retailers. Conway said the goal is to eventually expand into the U.S. market, but acknowledged the difficulty of becoming a major player in the world’s largest advertising market. “To be meaningful in retail in the U.S. is a much different proposition than Canada,” she said. “If we don’t have at least 5,000 locations, we’re not going to be able to [attract] the advertising. This story can be found at: http://marketingmag.ca/media/lesley-conway-joins-montreal-start-up-impax-media-162790.